Not sure how this depicts The World? Click here. Etteilla: Voyage, Route, Earth, Prima Materia, Empire, Permanence, Inertia, Animals. llustration (left): The World from Le Tarot Flamand by F. I. Vandenborre (c. 1780) (re-published by Carta Mundi). Click the image for a larger one. Lévi: This Hieroglyph depicts Kether, or the kabbalistic crown, between the four mysterious animals. In the middle of the crown is Truth holding a rod in each hand. Christian: This, the supreme Arcanum of Magism, is represented by a garland of golden roses surrounding a star and placed in a circle around which are set at equal distances the heads of a man, a bull, a lion and an eagle. 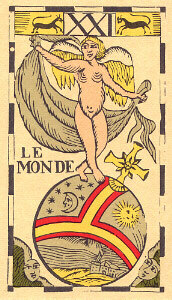 Papus: This card represents Macrocosm and Microcosm, that is to say, God and Creation, or the Law of the Absolute. The four figures placed at the four corners represent the four letters of the Sacred Name, or the four great symbols of the Tarot. Felkin: In this card we find a synthesis of the whole Taro or Rota. The central figure should be taken as Hathor, Athor, or Ator, rather than Isis. Waite: The four living creatures of the Apocalypse and Ezekiels vision, attributed to the evangelists in Christian symbolism, are grouped about an elliptic garland. Within it is a woman, who is in the act of dancing. It is eloquent as an image of the swirl of sensitive life, of joy attained in the body, of the souls intoxication in the earthly paradise, but still guarded by the Devine Watchers. Wirth: The World appears to the wise man like the miracle of the Single Thing of the Hermetists. By receivng the radical Unity or oneness of what exits, we rise to Gnosis, the supreme reward given to efforts made in search of truth. Case: The dancer represents the merging of self-consciousness with subconsciousness, and the blending of these two with superconsciousness. Here is a representation of what you really are, and what the cosmos really is. The universe is the Dance of Life. The immortal, central Self of youThat is the Eternal Dancer. Crowley [who also replaced the World with the Universe]: The proper method of study of this cardindeed of all but of this especiallyis long-continued meditation. The Universe, so states the theme, is the Celebration of the Great Work accomplished. 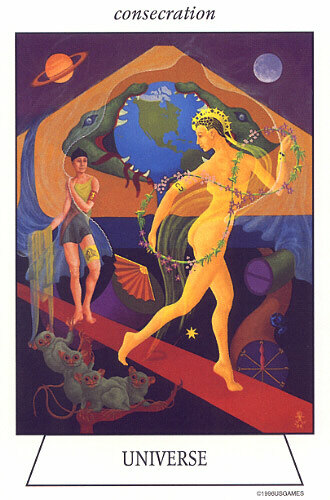 Sadhu: In the centre of the card triumphantly dances a naked woman, slightly touching the serpent with one foot. It is the metaphysical synthesis of the Absolute Truths, which does not need any protection, and which puts the one, who so far has arrived at these truths, beyond deceit. 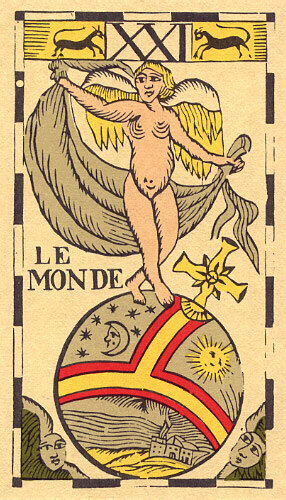 Illustration (left): The World, adapted from The Tarot by Mouni Sadhu, illustrated by Eva G. Lucas (copyright &COPY; 1962 George Allen & Unwin). Click the image for a larger one. Gray: Completion, reward, assured success. Triumph in all undertakings. Arrival at the state of cosmic consciousness. Can mean also movement in ones affairs, travel. ONeill: To the Renaissance mind, this card clerly represented the union of the spirit with the Anima Mundi, the aspect of God with which intimate union was possible. Pollack: One of the analogues of the World is Shiva, Lord of the Cosmic Dance. He too dances with arms out, one foot down and the other raised, the head balanced and the expression calm. Turk [who also replaced the World with the Universe]: Isis is seen here as a dancer in her aspect of seductive and ephemeral beauty. She carries a double garland in the sign of infinity, decorated with flowers of meadowsweet and deadly nightshade, and leaves of ivy and cannabis. Illustration (left): The Universe from Navigators Tarot of the Mystic Sea by Julia A. Turk (copyright &COPY; 1996 U.S. Games Systems). Click the image for a larger one. Symbol (above): It is best viewed sideways and depicts a figure dancing atop a globe, which sometimes comprises, in part, this Arcanum.